Vein problems are very common and have a wide range of symptoms. Symptoms can range from leg pain or leg swelling to the skin starting to darken and form a wound on your leg. Each symptom comes with it's own set of problems and are all caused by the same medical condition. The reason you have these symptoms is because of Venous Reflux (Venous Insufficiency). Venous reflux is a medical condition where blood within the veins no longer flows in one direction, against gravity, towards the heart. Venous reflux occurs when the one-way valves and vein walls become damaged or weakened allowing blood to flow the reverse direction back towards the ankle and feet. Over time this causes pressure to build within the veins causing symptoms such as: varicose veins, leg and ankle swelling, leg pain, night cramps, restless legs, and many other symptoms that can ultimately lead to skin breakdown, skin darkening or ulcers/wounds on the legs. Venous reflux is a progressive disease that gets worse over time if left untreated. Venous reflux accompanied by physical symptoms such as leg pain or swelling is a common medical condition. 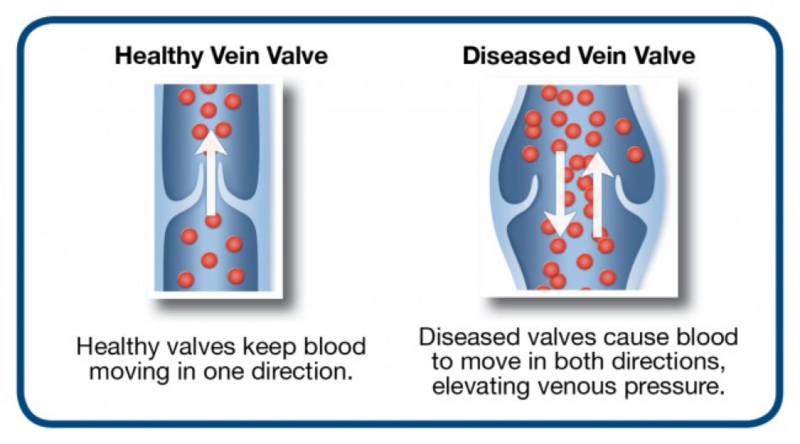 In fact, vein disease is 2 times more common than heart disease and 5 times more common than arterial disease. There are an estimated 50+ million Americans who suffer from venous reflux. An estimated 40% of women and 20% of men will experience the symptoms of venous reflux if left untreated. Of these, 20-25% of women and 10-15% of men will have visible veins including skin darkening, open leg wounds, spider veins and varicose veins. Not only are vein disorders often under-diagnosed or misdiagnosed, but many patients suffering from venous reflux are often told there is nothing that can be done other than wearing compression stockings or worse, vein stripping. Today, you no longer need to suffer from vein related issues. The good new is that, although this condition is very common, it's also very treatable. Today's treatments are much more elegant and can help aid in relief of your vein related suffering typically with little to no pain or downtime. Why do i have vein problems? Vein problems develop when veins that are supposed to carry blood towards the heart weaken and leak blood in the wrong direction. 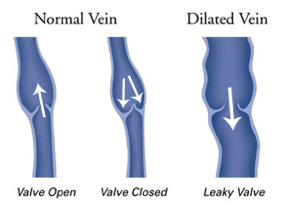 When these valves become weak or damaged and don’t close properly, blood may flow backward, which is known as venous insufficiency or venous reflux. When these veins cannot handle the excess blood and the pressure transmitted from the leaking veins, they cause problems including spider veins, varicose veins, skin darkening and other symptoms. Genetics & Family History – The most common contributing factor is a family history of vein problems. If your parents, grand parents or family members suffered with vein problems then the likelihood that you might develop vein problems is high. There is evidence of a genetic tendency that causes the vein walls to weaken and wear out over time causing Venous Reflux. Gender & Pregnancy – Gender is also a contributing factor. Sorry ladies, females have a higher likelihood of vein problems. Women tend to have more problems than men because of hormone changes and pregnancy. Pregnancy creates a lot of pressure in the vein system due to weight changes and blood flow increase during pregnancy, both for mom and baby. Weight Changes – Weight changes can also contribute to vein problems. There is little scientific evidence that shows that this is a huge factor, however, experience has shown us that significant weight loss of 40 pounds or more can often trigger vein problems to surface. The fat tissue around the vein acts as natural compression, and when this tissue is gone the veins no longer have that natural support system. Occupation (Long Sitting & Standing) – Occupations that require a lot of standing or sitting can contribute to vein problems. Gravity is the biggest player here. Gravity is always opposing the natural return of blood flow from the legs back to the heart. When you are sitting or standing for long periods of time, you are not activating the calf muscle pump which is responsible for the majority of the blood flow back to the heart. So then what should you do? Get up and move around or do calf raises or pedal pumps (moving your foot like you are pushing a gas/break pedal). Compression socks also act as a natural support system for your veins. It doesn’t activate the calf muscle but it does provide important support to the venous system. We Don't Know Why- Unfortunately, many times we are unable to determine the true cause of vein problems. We simply don’t know why. We DO NOT do vein stripping. Vein stripping compared to newer treatments is like sending messages by pony express instead of text or email. Treatment options now are virtually painless, performed in-office, and typically take between 30-60 minutes. There is little to no down time after treatment as you are up and walking immediately after. 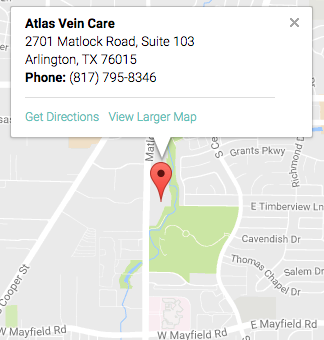 Stepping into our Atlas Vein Care office is the first step to treating your vein concerns. Each patient is different and treatment plans will depend on a comprehensive consultation and exam with the certified vein specialist.